In the first installment of this post, I posited that one factor contributing to disappointing results following a merger or acquisition is the flawed perception that transition services are not that important. I noted that this mindset may dilute the effectiveness of the post-deal enterprise(s) and result in unanticipated and unmitigated risks, lost or reduced revenues and/or interruptions of key business operations. This installment focuses on how best to avoid these issues by adhering to a practical set of informed best practices. Enable the enterprise(s) to fully exploit the targeted synergies of the deal. 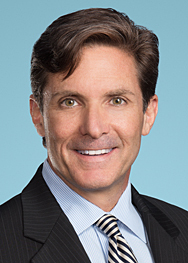 Put another way, the transition services should, at a minimum, “do no harm” to the value proposition being pursued, recognizing that the mechanisms for achieving this goal may differ depending on whether you are the seller or buyer (the recipient or provider of the transition services). Implementing an effective transition services regime is as much about process as it is about substance. In this installment I explore the key attributes of an effective transition services process from the perspectives of both the provider and the recipient of these services. Early, Informed Mobilization & Planning: Planning takes on a different meaning and requires different actions depending on whether you will be providing or receiving the transition services, although there is some overlap in certain front end elements. From either perspective, early and informed planning sets to the table for a more efficient process. Targeted and Efficient Due Diligence & Execution: The diligence effort generally is thought of primarily as buyer responsibility. After all, it is the buyer that scours the data rooms and SharePoint sites to review financials, asset listings, org. charts, contract information and related data to formulate a bid, assess valuations and evaluate the merits of the transaction. However, in the transition services context, it is incumbent on both the buyer and seller to undertake an informed diligence exercise. It fact, I have found that an inefficient and undisciplined seller diligence process can contribute to escalating transaction costs, unnecessary (sometimes unanticipated) risks and chaos leading up to closing—both in terms of finalizing the transition services agreement (TSA) and addressing the actions required to transfer third party agreements (such as enterprise software licenses) to the buyer. 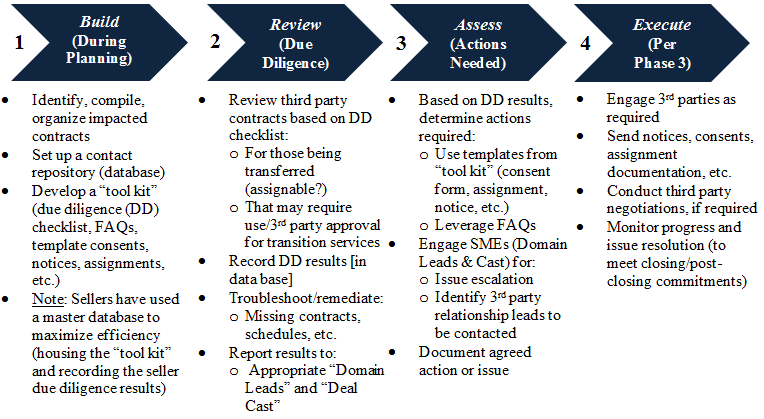 Building on the key planning attributes described above, sellers have found that the following four phase process (with key features summarized) helps drive efficiencies in both (a) the disposition of third party, enterprise contracts included in the sale and (b) the development of the TSA package. While not all transactions involve a level of complexity requiring each of elements below, we have deployed some form of this model (or components of it) in a number of transactions (both big and small). The substance of certain aspects of this process will necessarily be driven by the representations & warranties, covenants, closing conditions and other terms of the agreement. 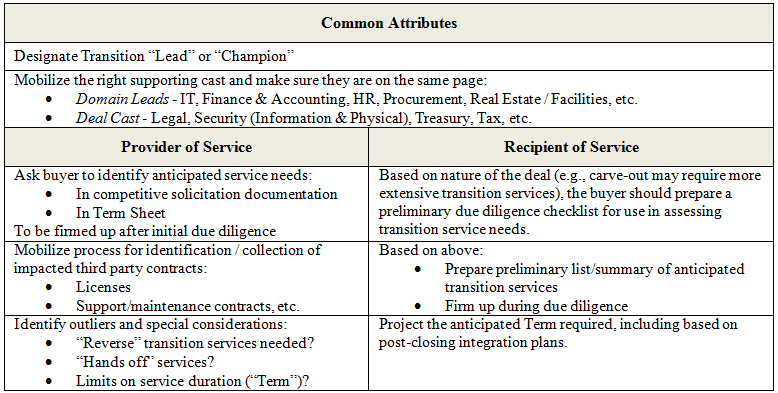 However, if properly implemented and executed, this model promotes a “straight-through” process to ensure that the full life-cycle of the transition service process (from pre-signing through closing) runs smoothly and efficiently. 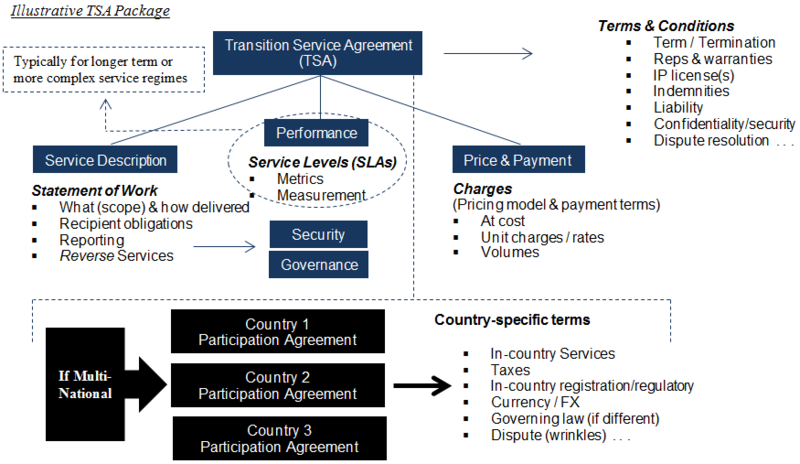 The geographic scope of the transaction (e.g., multi-national transactions with cross-border service requiring special terms and in-country implementation mechanics, such as participation or subscription agreements). Term – Where the TSA covers multiple service towers (e.g., IT, F&A, etc. ), not all towers will necessarily have the same service Term. If so, care should be taken to delineate the Term for each service. Confidentiality – I have frequently seen confidentiality provisions in the TSA that are inconsistent with those in the purchase agreement. While there may be additional provisions (e.g., enhanced data protection, especially if personally identifiable information is accessed or stored as part of the services), these provisions should be aligned so the parties are not subject to disparate and potentially conflicting obligations. Security – Information and physical security has received (rightfully so) increased attention. Care should be taken to ensure that both the provider and recipient of services are obligated to comply with documented security policies and standards (attached to the TSA). Indemnities – Similar to confidentiality, the indemnity provisions (including the procedures) should be aligned with the corresponding provisions of the Purchase Agreement. Governing Law / Venue Dispute Resolution: Ordinarily the prudent course is to incorporate the corresponding terms of the purchase agreement. However, questions of enforceability for certain terms, recognition of judgments or awards and other jurisdictional considerations may require alternative treatment in the participation or subscription agreements entered into for each country. Taxes – Cross-border tax issues may also require additional treatment. Currency/Foreign Exchange – The TSA should specify the currency for service charges and, if applicable, the exchange rate protocol. Performance Standards – Service levels (meeting defined service quality measures like timeliness) may or may not be applicable in a given transaction. The parties may agree instead to service delivery “consistent with historical measures as of the Closing Date” or similar formulations.Pricing – Sellers often provide the services “at cost.” Buyers should interrogate how this is determined (e.g., how overhead is computed, allocated, etc.). Fixed monthly charges, time & materials (at agreed rates) and other mechanisms also should be considered. In the M&A world transition services will not make the headlines. Indeed, I sometimes compare transition services to offensive lineman. That is, unlike the quarterback, lineman may make the highlight reels only when the quarterback is sacked. Likewise, transition services only get the attention of management when things go wrong (service disruption, customer complaints, etc.). To avoid a sack (or getting caught with your transition services down) consider giving this aspect of the transaction greater attention and applying the best practices highlighted above.